Around the year 167 BCE, the ruler of the Syrian kingdom Antiochus sought to pull Jews away from Judaism so that all his subjects in his vast empire-which included the Land of Israel-would share the same Greek Hellenist culture. He marched into Jerusalem, vandalized the Temple, erected an idol on the altar, and desecrated its holiness with the blood of swine. Decreeing that studying Torah, observing the Sabbath, and circumcising Jewish boys were punishable by death, he sent Syrian overseers and soldiers to villages throughout Judea to enforce the edicts and force Jews to engage in idol worship, and during this period, many of the Jews began to assimilate, taking on Greek names and marrying non-Jews. When the Syrian soldiers reached Modi’in they demanded that the local leader and elder Matityahu the Kohen be an example to his people by sacrificing a pig on a portable pagan altar. He refused and killed not only the Hellenized Jew who stepped forward to do the Syrian’s bidding, but also the king’s representative, Apelles, in order to enable him and his sons to escape. Matitiyahu and his five sons (Jonathan, Simon, Judah, Eleazar, and Yohanan) fled to the hills and caves of the wooded Judean wilderness. Within a few months of this incident, Matityahu died and he left instructions that this third son, Judah who was known as ‘the Maccabee’ (literally, ‘the hammer’ because he and his brothers were said to strike hammer blows against their enemies) lead the fight. Over a period of three years Judah, his brothers and his followers were able to overcome the military superiority of Antiochus’ army and on the 25th Kislev 164 BCE the Maccabees regained control of the Temple. On this day, the 25th Kislev, they held a ‘Chanukah’ (lit. dedication) of the Temple with proper sacrifice, rekindling of the golden menorah, and eight days of celebration and praise to God. When it came time to re-light the Menorah, they searched the entire Temple, but only one small jar of oil bearing the pure seal of the High Priest could be found. Miraculously, the small jar of oil burned for eight days, until a new supply of oil could be brought. From then on, Jews have observed a holiday for eight days in honour of this historic victory and the miracle of the oil. On every night of Chanukah, Jews light their Chanukiah in prominent positions – ideally by a window or door and facing a public area – for פרסומי ניסא (in order to ‘publicize the miracle of Chanukah’). While it would suffice to light just one candle each night, the custom developed to add a further candle each night so that by the eighth night of Chanukah, all eight candles are lit. 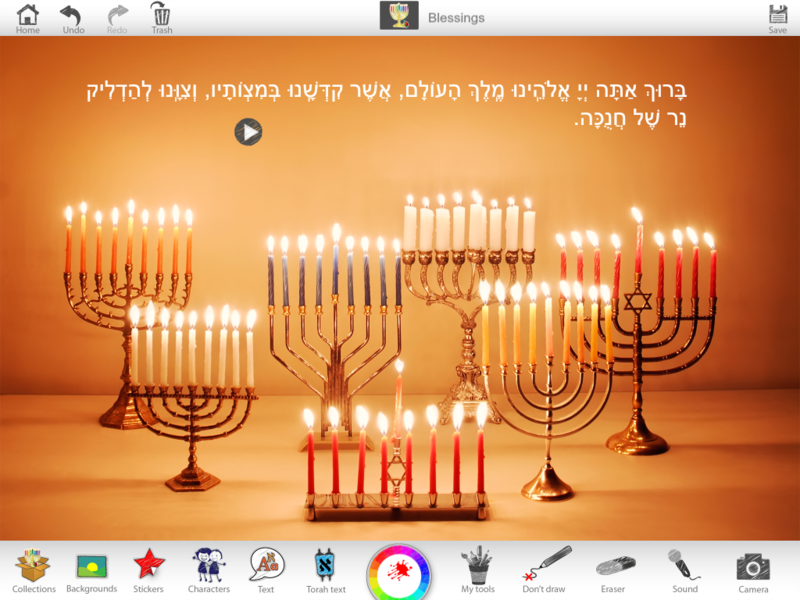 Prior to lighting the candles, two blessings are recited (להדליק נר של חנוכה + שעשה ניסים) and on the first night of Chanukah, the additional blessing of שהחיינו is recited. 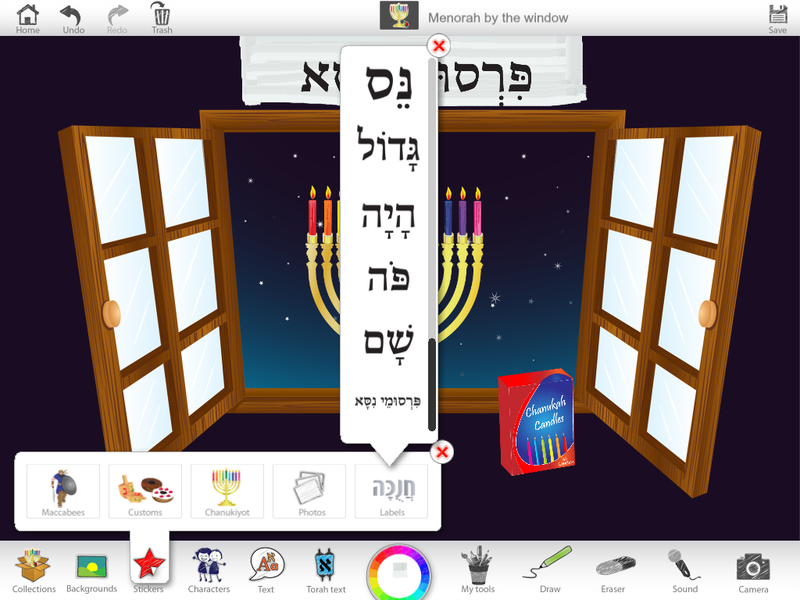 When the candles are lit, it is customary to sing the songs הנרות הללו and מעוז צור. There are numerous Chanukah customs. One of them is to play with a ‘dreidel’ which was used as a ruse when Torah was being taught after the decree of Antiochus. The dreidel is often labelled with the letters נ(נס)-ג(גדול)-ה(היה)-פ(פה)\ש(שם). Another is to eat foods made with oil, to recall the miracle of the oil. On Chanukah, we sing הלל and add the prayer of על הניסים into our daily Amidah and Birkat Hamazon. 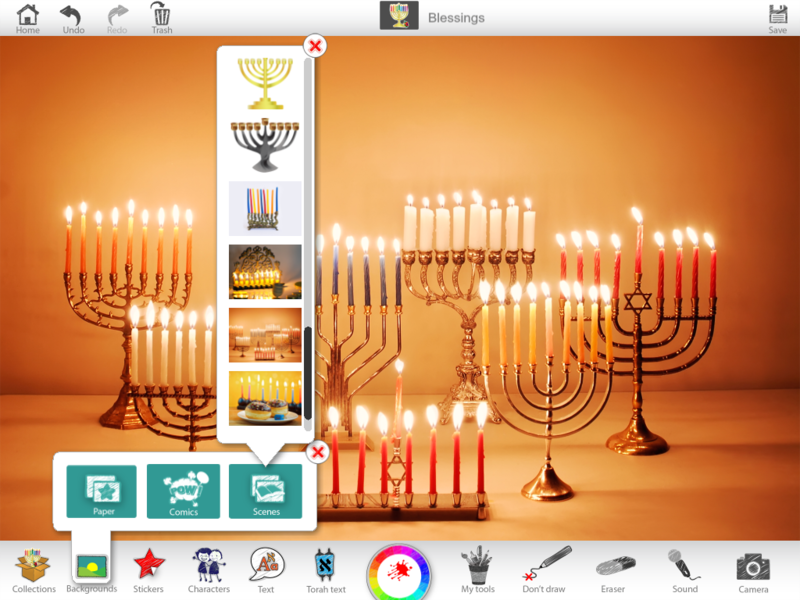 1b) From Backgrounds > Scenes or Stickers > Chanukiyot, choose a Chanukiah (Menorah). 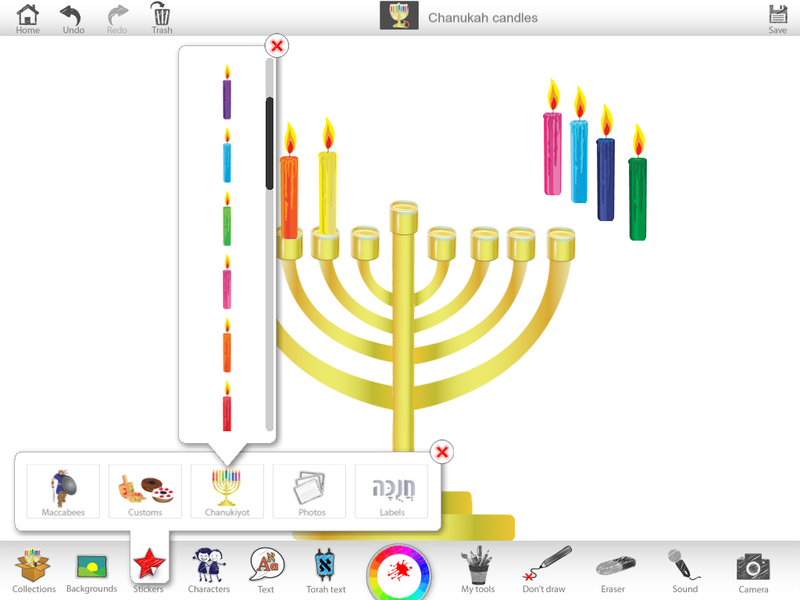 1c) Then again from Stickers > Chanukiyot, place the candles on the Chanukiah to reflect the correct day of Chanukah. 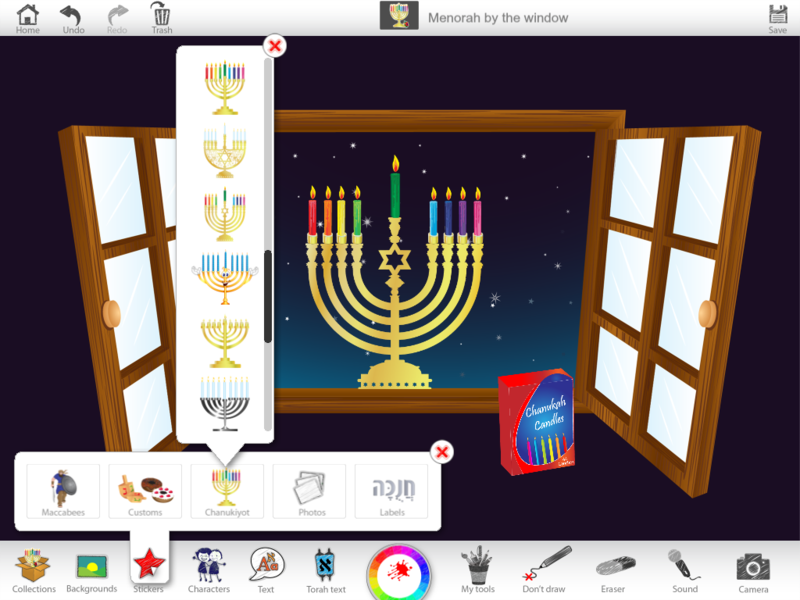 1d) Use the Sound tool to insert a song that you would sing around the lit Menorah. 2b) Select Backgrounds > Comics and choose a comic strip with 4 frames. 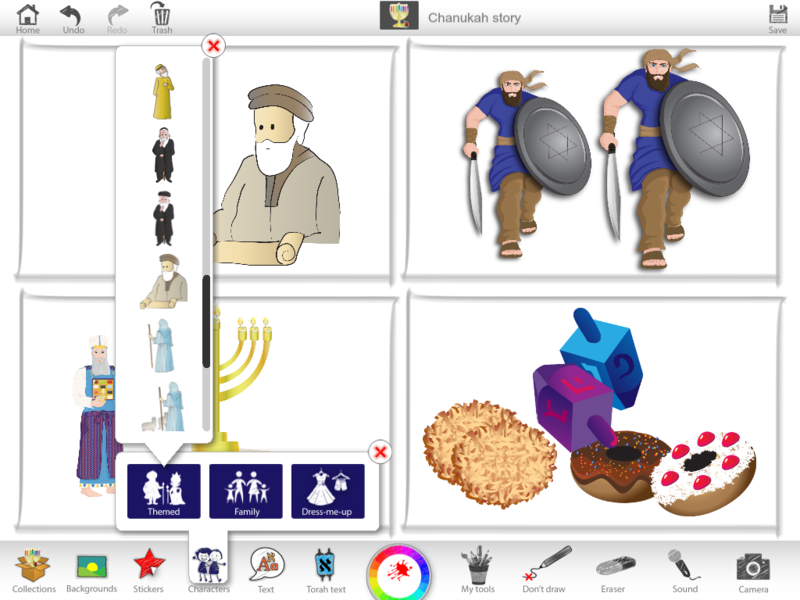 2c) Using the images available in all the Stickers, tell the Chanukah Story. 2d) From Characters > Themed, insert a picture of a Rabbi studying Torah. 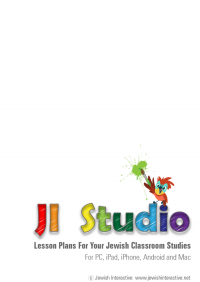 Lock the picture so that you will be able to draw on top of the image. 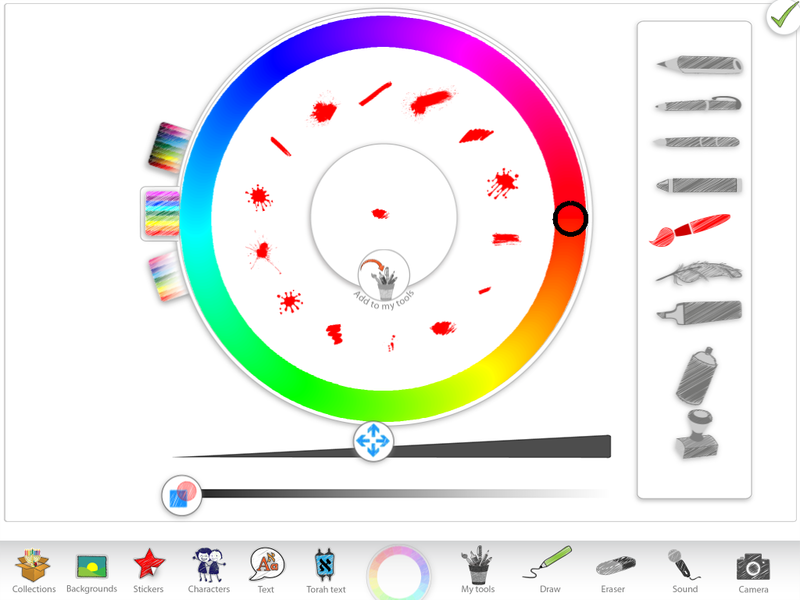 2e) Using the Drawing Wheel, select any red tool, click the button Add to my tools. 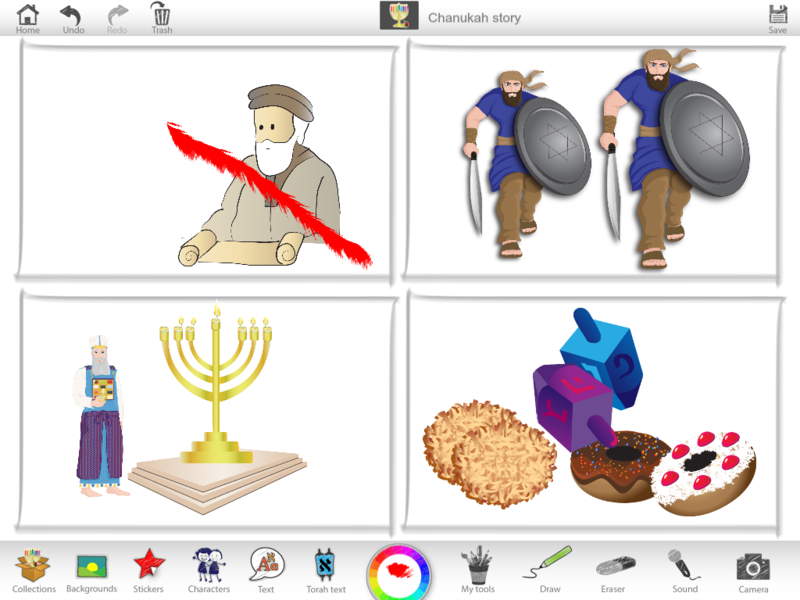 Draw a red line through the comic frame with the rabbi, to show that Jews were not allowed to study Torah. 2f) From Stickers > Maccabees, insert pictures of Maccabee soldiers. 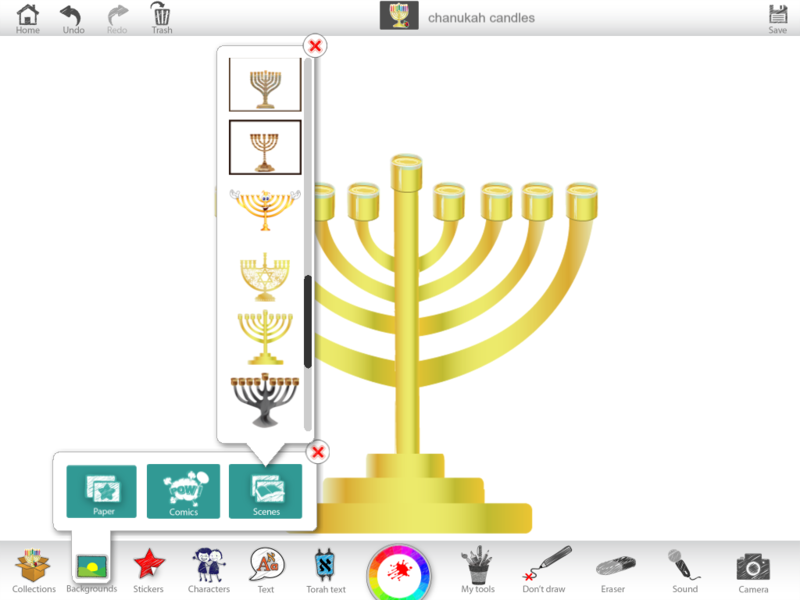 2g) Insert a picture of the Golden Menorah from the Temple. You can find this in Stickers > Maccabees. 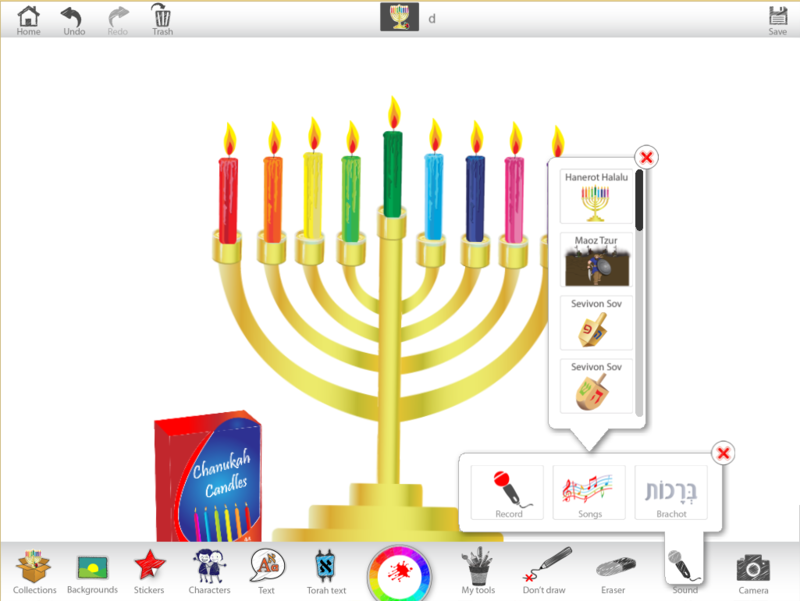 2h) Insert pictures of Chanukah customs today from Stickers > Customs. 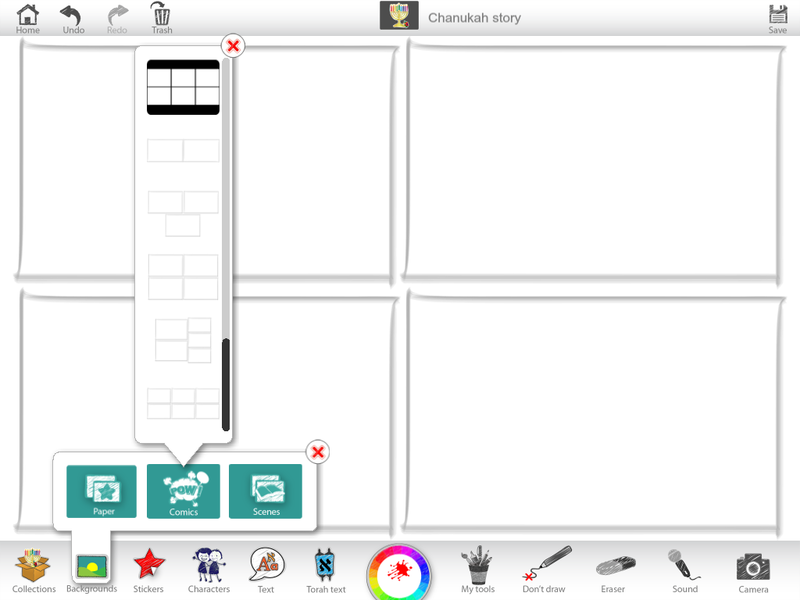 3c) Place a Chanukiah from Sticker > Chanukiyot by the window. פרסומי ניסא. 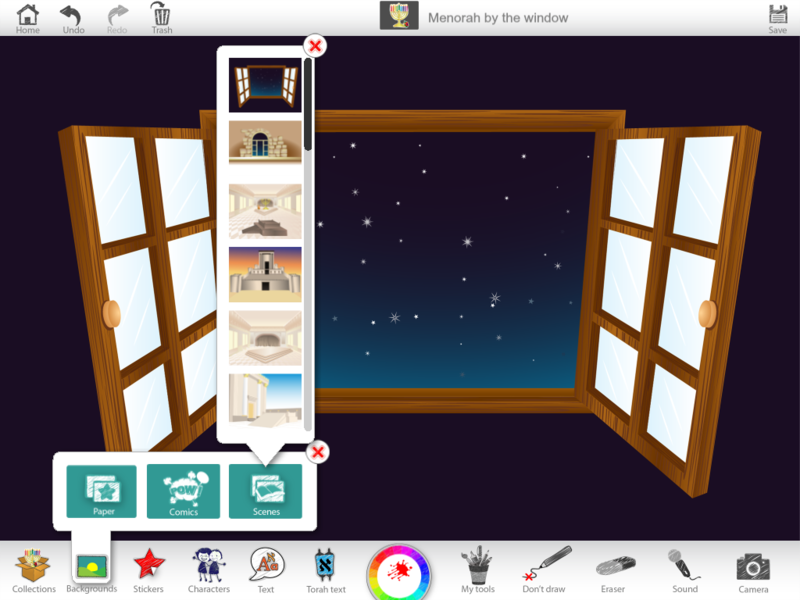 You may need to draw a light area on which to place the label, using the Drawing Wheel. 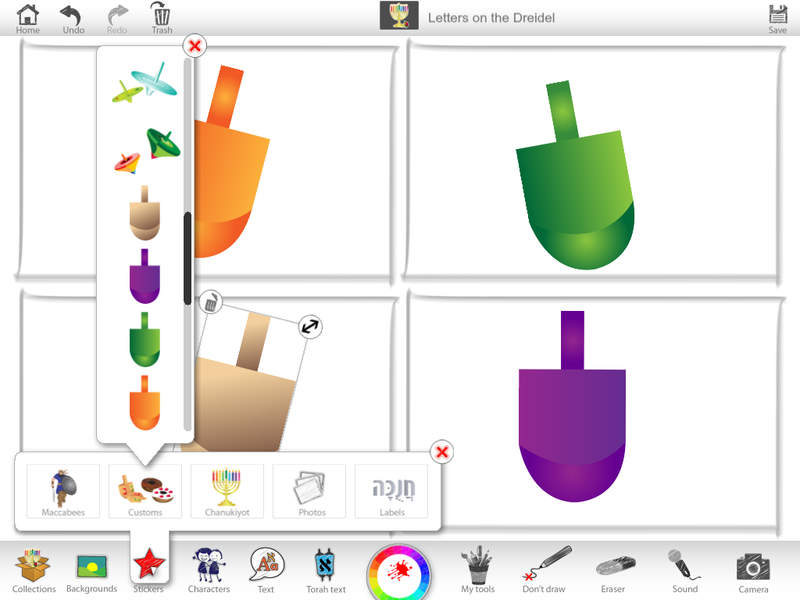 Review the meaning of the letters on the dreidel. 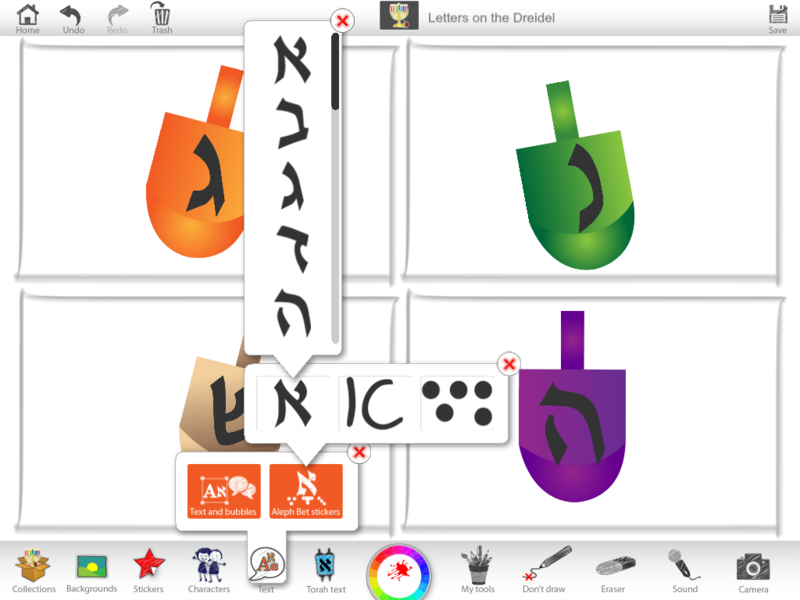 4d) Using Text > Aleph Bet stickers, choose the letters נ-ג-ה-פ\ש and place them on each dreidel. 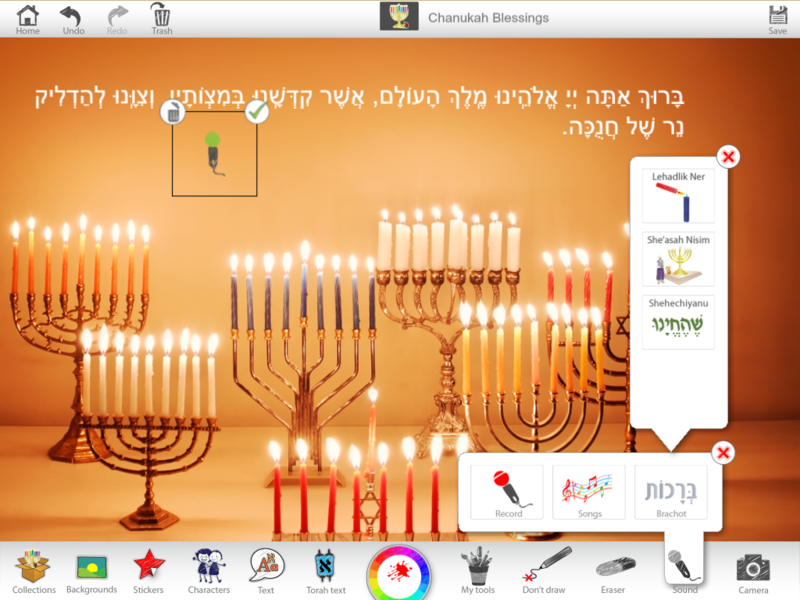 5c) From Torah texts > Tefilot, select the Chanukah blessings. 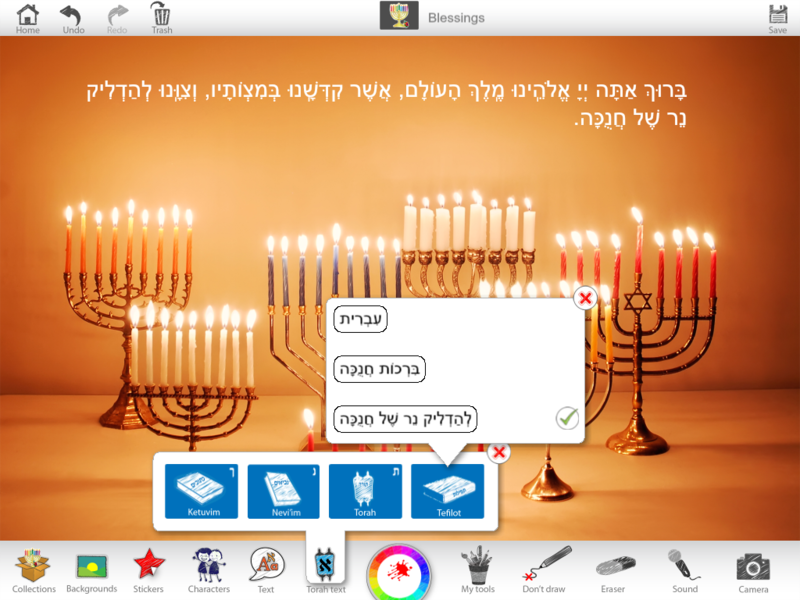 5d) Using the Sound recorder, students should record themselves reciting the Chanukah blessings. 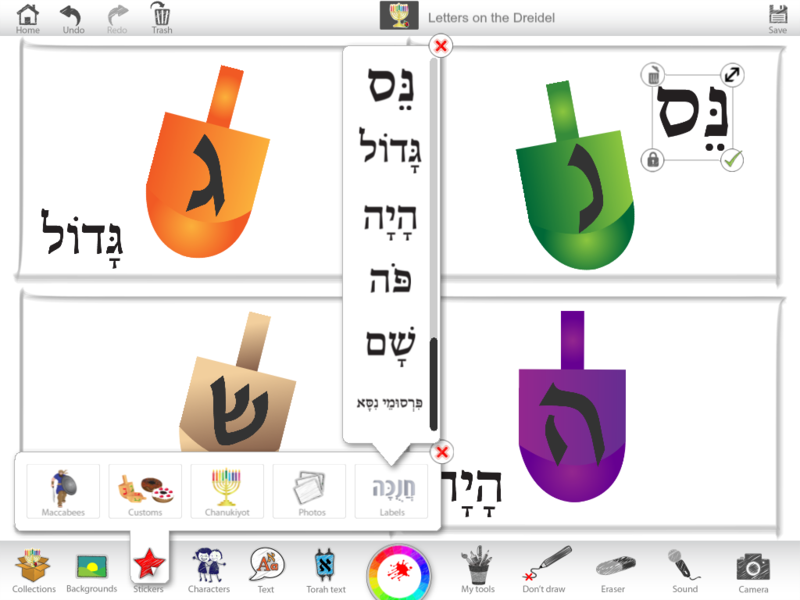 You may instead want to insert the songs of each Bracha that are included in the Sound tool. 5e) Place the Sound sticker next to the relevant blessing.